June 16, 2011 – Istrouma High School is long known for its tradition of winning State Championships in Football in 1938, 1950, 1951, 1955, 1956, 1957, 1959, 1961 & 1962. It’s also known for producing great players like Heisman Trophy winner and former LSU Running Back Billy Cannon, All American George Rice from LSU, and Running Back Daniel Porter, recently from Louisiana Tech and the Canadian Football League and the list goes on and on. There’s a new Head Football coach for the 2011 season in former St. Helena Central Football player and former University of Louisiana at Lafayette Ragin Cajun Defensive Back, Johnny Felders. Johnny might be the new head coach, but he’s not new to Istrouma. This will be his 5th year at Istrouma (four years prior he was an assistant). After spending some time with coach in off season work outs recently I really gained a ton of respect for how hard he’s working, and how intense he is to get this program back on course to winning. However, more importantly, he’s building it back through discipline and hard work. Coach Felders is just what Istrouma needs to get this program back. I love the young staff. Most of the assistants are former college football players that know what hard work is all about. Some of the guys have the experience at other schools that are used to winning. I hope the young kids buy into what Johnny Felders is trying to get across with his no short cuts to winning, tough nose, and intense approach, but also rewarding to kids when they do a good job. He keeps these kids accountable and on their feet. I remember when Johnny played for St Helena Central. He was a hard nosed player as a Quarterback and Defensive Back. I remember their team with only 30 or so players where 13 to 14 players were playing mostly both sides of the ball and the team was making the playoffs. Four of the kids including Johnny Felders signed scholarships to the University of Louisiana at Lafayette, and a big tough Defensive Tackle by the name of Stanley Doughty (6-2, 310 pounds) went to South Carolina of the SEC. I asked coach about his former college, and he had some great things to say. 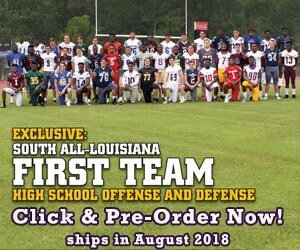 I will have more on the Istrouma Indians in the 2011 Louisiana Football Magazine Preview issue which is available for pre-order at www.lafootballmagazine.com/store. Assistant Defensive Backs coach Brian Galloway played football at Alcorn State and is from Tylertown, MS.
Assistant and Offensive Line coach John E. Robinson has an interesting story. He played for John Marshall High School in Richmond, Virginia, which was in the same football district as Hermitage High School where New Orleans Saints Safety Darren Sharper played. John E. Robinson actually played against Darren Sharper in High School every year and his brother Jamie Sharper, who played for the Baltimore Ravens and Virginia University as a Linebacker. Robinson said, “Lee, Jamie Sharper, Darren’s brother, was the better high school player coming out of high school, but you could tell that Darren, as smart as he was, would become a good player. I’m just surprised at how long he’s been able to play in the NFL. Jamie is now retired, and Darren went to William & Mary College, and I think is going into his 15th or 16th year. He was a nice guy in high school.” Coach Robinson told me there is no spring football in the State of Virginia. Head Coach Johnny Felders played football at the University of Louisiana at Lafayette as a Cornerback and Strong Safety and finished in 2007. Assistant Derrick Green, who coached at Catholic High School for 5 years in Baton Rouge, is now at Istrouma for the 2011 season. Assistant Coach Burnell Taylor played college football at Nicholls State and went to Warren Easton High School in New Orleans.